short girl, long island. : Teach Me Something Thursday, Volume Thirteen. 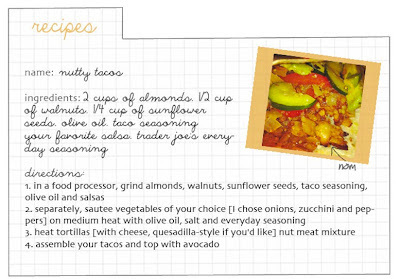 The thirteenth installment of TMST is a veg-friendly spin on one of my favorite foods - tacos! Allie, from the awesome blog, Beauty + the Feast, shows us how to make these meatless treats with nuts. Yes, you read that right. These tacos can be made vegan or vegetarian, its up to you. Print out the recipe card to see what you'll need for the "meat" + head to the store to snag all of the usual suspects [tortillas, favorite cheese blend, veggies, etc.]. Enjoy! Hi, short girl, long island. readers! I'm Allie and I blog over at Beauty and the Feast (you should come on by and say hello)! Today I am here to teach you all how to make "nutty tacos," a great and healthy vegetarian taco alternative. Full of protein, these tacos will surprise the biggest meat eater... I promise! Don't forget to head over to Beauty + the Feast for more fantastic recipes + other treats!